Bill Gates thinks toilets are a serious business, and he’s betting big that a reinvention of this most essential of conveniences can save a half million lives and deliver US$200 billion-plus in savings. The billionaire philanthropist, whose Bill & Melinda Gates Foundation spent US$200 million over seven years funding sanitation research, showcased some 20 novel toilet and sludge-processing designs that eliminate harmful pathogens and convert bodily waste into clean water and fertilizer. 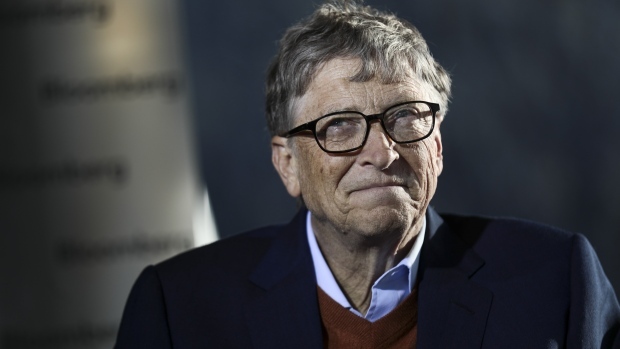 Holding a beaker of human excreta that, Gates said, contained as many as 200 trillion rotavirus cells, 20 billion Shigella bacteria, and 100,000 parasitic worm eggs, the Microsoft Corp. co-founder explained to a 400-strong crowd that new approaches for sterilizing human waste may help end almost 500,000 infant deaths and save US$233 billion annually in costs linked to diarrhea, cholera and other diseases caused by poor water, sanitation and hygiene. Without cost-effective alternatives to sewers and waste-treatment facilities, urbanization and population growth will add to the burden. In some cities, more than half the volume of human waste escapes into the environment untreated. Every dollar invested in sanitation yields about US$5.50 in global economic returns, according to the World Health Organization. The reinvented toilet market, which has attracted companies including Japan’s LIXIL Group, could generate US$6 billion a year worldwide by 2030, according to Gates. Companies displaying their sanitation technologies included China’s Clear, CRRC Corp. and EcoSan; Sedron Technologies LLC from the U.S.; SCG Chemicals, a unit of Thailand’s Siam Cement Pcl; and India’s Eram Scientific Solutions Pvt, Ankur Scientific Energy Technologies Pvt, and Tide Technocrats Pvt, the Gates Foundation said in an emailed statement. “Our goal is to be at 5 cents a day of cost,” Gates said in a telephone interview before the exhibition. Small-scale waste treatment plants, called omni-processors, may be suited for uses beyond human waste management -- such as for managing effluent from intensive livestock production -- because of its low marginal running costs relative to the value of the fertilizer and clean water it produces, he said.